FEMA has been in the process of certifying flood protection levees nationwide. A recent study ordered by FEMA has determined that the Live Oak Acres Levee along the Ventura River, originally constructed by the U.S. Army Corps of Engineers, cannot be certified as meeting FEMA’s new standards. This means that FEMA will likely include more than 100 properties behind the levee in the mapped floodplain. Besides 106 properties expected to be redesignated into a floodplain, 127 others may be affected by the remapping. 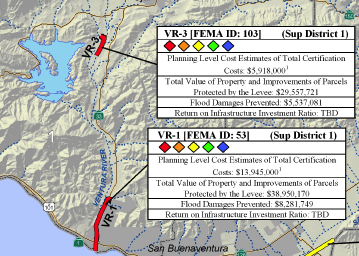 Nine levees in Ventura County have been identified by FEMA as trouble spots; two in Districts 1 and 4, one in Districts 2 and 5, and three in District 3. If the levees are not 'certified' to provide 100-year protection, FEMA will remap the levee-impacted areas landward of these levee systems as high-risk areas, referred to as Special Flood Hazard Areas (hazard areas). Flood insurance will be required in hazard areas for any mortgage that is Federally backed, regulated, or insured. It is important to note that neither certification nor accreditation guarantees flood protection. COMMENTARY: The estimated cost for Ventura County to upgrade all 9 levee systems is $26.9M. And all of the flood control structures in the county require expensive ongoing maintenance in perpetuity. This is just part of the taxpayer burden for floodplain development, not to mention the ecological cost of degraded habitat and water quality. And providing this protection, at public expense, alleviates the property owner from providing their own insurance against flood damage. Although one might expect government to learn from the mistake of permitting floodplain development, no legal or regulatory mechanism currently exists to deter further urbanization of flood-prone areas. For more information and to view the Ventura County Watershed Protection District FEMA Levee Certification Project map, go to vcwatershed.org/levee.